Swami Vivekananda needs no introduction, for his is a household name in India. Swamiji was one of the greatest spiritual leaders of the modern world, a great lover of humanity whose unconditional love extended to all people without any distinctions of caste, class, creed, race, region or religion. 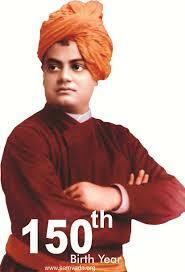 The Celebration of Swami Vivekananda’s actual 150th birth anniversary year is January 2013—January 2014. The event will no doubt be celebrated by many organizations and lakhs of people all over India and in many other parts of the world. The Government of India itself may make it a national celebration. 1. Bear in mind, my children, that only cowards and those who are weak commit sin and tell lies. The brave are always moral. Try to be moral, try to be brave, try to be sympathising. 2. Do not be afraid of a small beginning, great things come afterwards. Be courageous. Do not try to lead your brethren, but serve them. The brutal mania for leading has sunk many a great ship in the waters of life. Take care especially of that, i.e. be unselfish even unto death, and work. 3. "Wake up, stop not until the goal is reached", say the Vedas. Up, up, the long night is passing, the day is approaching, the wave has risen, nothing will be able to resist its tidal fury. The spirit, my boys, the spirit; the love, my children, the love; the faith, the belief; and fear not! The greatest sin is fear. 4. Let each one of us pray day and night for the down - trodden millions in India who are held fast by poverty, priestcraft, and tyranny -- pray day and night for them. I care more to preach religion to them than to the high and the rich. I am no metaphysician, no philosopher, nay, no saint. But I am poor, I love the poor. I see what they call the poor of this country, and how many there are who feel for them! What an immense difference in India! Who feels there for the two hundred millions of men and women sunken for ever in poverty and ignorance? Where is the way out? Who feels for them? They cannot find light or education. Who will bring the light to them -- who will travel from door to door bringing education to them? Let these people be your God -- think of them, work for them, pray for them incessantly -- the Lord will show you the way. 5. Know that every time you feel weak, you not only hurt yourself but also the Cause. Infinite faith and strength are the only conditions of success. 6. Cultivate the virtue of obedience, but you must not sacrifice your own faith. No centralisation is possible unless there is obedience to superiors. No great work can be done without this centralisation of individual forces....Give up jealousy and conceit. Learn to work unitedly for others. This is the great need of our country. 7. I hate cowardice; I will have nothing to do with cowards or political nonsense. I do not believe in any politics. God and truth are the only politics in the world, everything else is trash. 8. My ideal, indeed, can be put into a few words, and that is to preach unto mankind their divinity, and how to make it manifest in every movement of life. 9. 9.Unselfishness is God. One may live on a throne, in a palace, and be perfectly unselfish; and then he is in God. Another may live in a hut and wear rags, and have nothing in the world; yet if he is selfish, he is intensely merged in the world. 10. Who will give the world light? Sacrifice in the past has been the Law, it will be, alas, for ages to come. The earth's bravest and best will have to sacrifice themselves for the good of many, for the welfare of all. 11. All love is expansion, all selfishness is contraction. Love is therefore the only law of life. He who loves lives, he who is selfish is dying. Therefore love for love's sake, because it is law of life, just as you breathe to live. 12. Take up one idea. Make that one idea your life - think of it, dream of it, live on idea. Let the brain, muscles, nerves, every part of your body, be full of that idea, and just leave every other idea alone. This is the way to success. 13. Just as in case of Arjuna he saw only the eye of bird and this shows the concentrations he had and thus he was the automatic choice to receive the teachings of GITA by Lord Krishna. 14. You have to power to make or destroy your LIFE. FROM today BLAME NONE and direct your MIND to achieve your GOAL.